LogMeIn, the remote access company that terminated all its free user accounts with a 7-days grace period, just acquired Lastpass for $125 million in cash. LastPass was a password manager with both free account and a premium plan at $12 per year which allowed you to sync your passwords across all your devices. It was known for its focus on customer service (you could just send them an email without having to jump through hoops). And as they were a small company, the people at LastPass were dedicated to your online security. When you’re [LastPass] Premium, you’re part of the family. But the new owners of the password manager may be not so keen on customer service. After providing free remote access services for over a decade, LogMeIn abruptly stopped the free service, with a prior notice of just 7 days, which came of course with an enormous price hike: their revenue per paid customer increased by a whopping 500%. This news has just ruined my day. Now I’m going to have to spend this weekend moving to an other password manager. LogMeIn is probably one of the most unethical software companies in existence. Seriously, this is just one step above selling to the NSA. What contempt for your user base. Sure, you can wait to know the policies applied by the new management of LasPass – but you take the risk of being unable to export your passwords and secure notes to another password manager when (and if) they delete free accounts and introduce their new pricing –. Dashlane is the password manager that comes closest to LastPass: it has browser extensions, apps. It also integrates nicely with Safari on iPhone (you just 'share' the website you're browsing to Dashlane, put your finger on the TouchID and bam!, you're logged in). Like with LastPass, you can generate secure passwords, fill forms, and there's even a security score to evaluate the strength of your account. About encryption, your data on Dashlane is encrypted with AES-256, and you choose either to keep your passwords on your hard drive (locally) or to sync them across devices. Pricing is a bit steeper than Lastpass, at $39/year for the premium version. The free version works only locally, as it includes all the features of the paid version, except sync, backup, and web access. Dashlane has clients for almost every device, except for Linux and Windows Phone. Compared to Laspass, 1Password has most of its features, but licensing is very different: instead of a yearly subscription, you buy a license for every platform. If you have 1 Android phone, an Android tablet, an iPad and 3 Windows PCs, for example, you'll have to buy 1 license for Windows, 1 for Android on the Play Store, and one for iOS on the App Store. 1Password is a one-time purchase, but if you have lots of different types of devices, it may get expensive. Nethertheless, if you have several devices on the same platform, you only pay one license. Unfortunately, the one-time charge is per major revision: if they release a new major version of their software, you'll have to pay again. 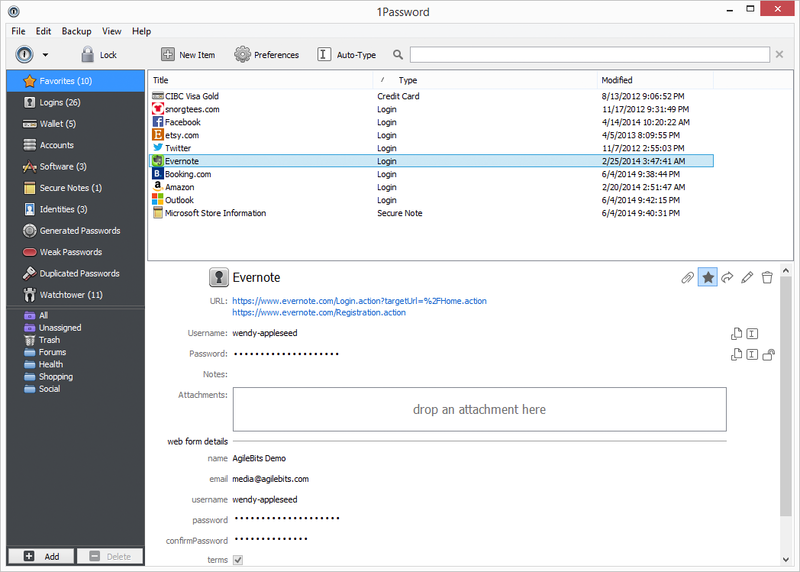 1Password includes a secure password generator, and Watchtower, a service that securely checks your logins for known vulnerabilities and tells you on which websites you need to change your passwords. 1Password is available for Mac, Windows, Android, and iOS. They also have browser extensions for Opera, Chrome, Safari and Firefox. While it has an unintuitive name, RoboForm is the oldest password manager (15 years!). RoboForm's name comes from its ability to fill forms automatically, using identities. It includes a secure password generator, and you can save much more than passwords with Roboform: logins, bookmarks, contacts, identities, safenotes (an equivalent of Laspass' Secure Notes). And you can either keep all your Roboform data locally on your hard drive (it's free) or sync it across all your devices with Roboform Everywhere. About licensing, RoboForm is a mix of Lastpass and 1Password: you can either buy a 1-year Roboform Everywhere subscription at $9.99 the first year, then $19.99/year, or you can choose to buy one-time licenses for each of your computers. RoboForm is available on every platform: Windows, Mac, iOS, Android, Linux, Windows Phone, Windows RT (Metro). Extensions are available for Chrome, Firefox, Safari, IE, Opera. You can even install RoboForm on your USB key as a portable application. And if you use an exotic platform not listed here, there's still the bookmarklet option. RoboForm has a built-in wizard to import all your data from other password managers, including Lastpass. KeePass: Open-Source, free, and local (or you can store your encrypted passwords on your favorite cloud service). Encryptor: Open-Source and cloud-based. Made with the help of SpiderOak. Encrypts passwords locally, with Zero-knowledge encryption. SplashID Pro: Sync with Wifi, cloud or just use it locally, automated backups, in business for 10 years. Lifetime SplashID Pro at StackSocial for $25. Hashing, salting and 256-bit encryption of passwords. Enpass: broad platform support, choose your cloud. AES-256 and 24,000 rounds of PBKDF2. 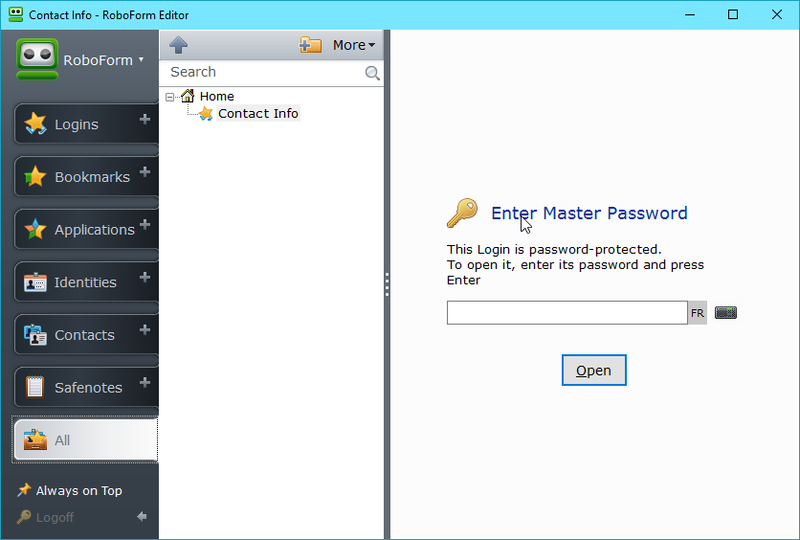 pass : Unix password manager with GUI client and plugins. Okey: currently in alpha, uses TouchID and Apple Watch. To address the concerns that some in our community have raised, I want to personally assure you that this is good news for our users. First of all, we (LogMeIn/LastPass) have no plans to change our existing business model. Secondly, this acquisition provides us with access to resources that will enable us to innovate faster, as we continue to strive to deliver an even better product than the one you have come to know and love. It is also important to note that the current LastPass team is staying in place and remains committed to deliver on the promise of privacy, security and convenience that has been our mission since day one. I appreciate and am proud of the passion of our community, and we will continue to work hard to maintain your deep loyalty. Choosing whether or not you'll be staying with LastPass should be primarily based upon one answer: do you trust them? Would you trust LogMeIn with your most private data?